Successfully Added M9912 X6 Mini Quadcopter + Remote Control - 2.4GHz Wireless Remote Control, LED Lights, 4 Channels, 6 Axis 360 Degree Spin to your Shopping Cart. Take to the skies with the super fun lightweight mini quadcopter with a handy remote control. Ready to fly? Then this mini-quadcopter will guarantee the best maiden flight experience! It’s super compact, lightweight, easy-to-control and smooth to fly. Ready to use right out-of-the-box, it will bring loads of fun to your home. If you are new to the quadcopter world and not sure if you can handle bigger models, this mini drone is the best place to start. Equipped with the latest 6-axis flight control system with adjustable gyro sensitivity, it will obediently follow your every command. Equipped with a set of LED lights, the mini quadcopter is ready to take to the skies even after dark. So, if you feel like having some fun after work, it will be the perfect little toy to being along on your evening stroll. Safe and easy-to-operate, the mini quadcopter would make a great gift for kids and is always fun to have around at a picnic, park outing, hike or even fly indoors. Thanks to its small size, the mini-drone won’t cause any damage to your home and comes with a very reasonable price tag. 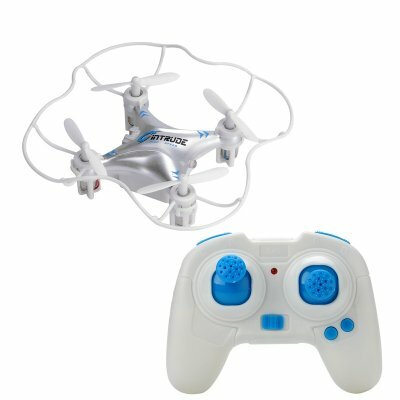 The M9912 X6 Mini Quadcopter brought to you by the leader in electronic devices as well as mini quadcopters..